The bar stools are for adult,if there are children in your house,please pay attention to it,don't let them Climb the bar stool.Maybe it will tip over if the child climb it. Dimension: 16" W x 15" D x 21.5"-31.5"H; Seat back dimension: 14.5" W x 12" H; Cushion dimension: 16" W x 15" D; Chrome base diameter 15.75"
Suitable for kitchen,dining room, coffee room,resting room,entertainment centres and office,bring you more convenience and comfortable experience. 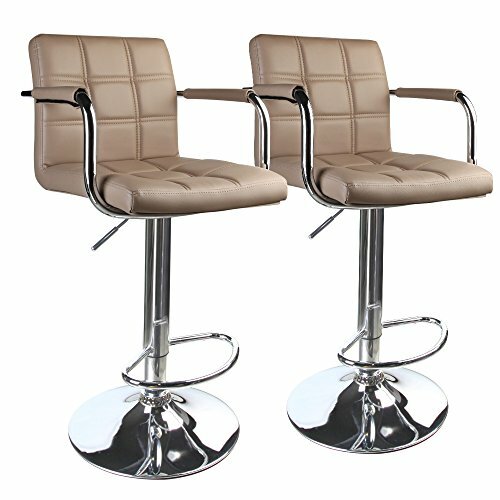 Easy to assemble,will take less time to assembly the bar stools with the instruction,Photo may slightly different from Actual Item in Terms of color due to the lighting during Photo Shooting or the Monitor's display.